There is a serious flaw with the suggestion mobile radios be wired across battery terminals. The negative radio lead should actually not have a fuse, and not be wired to the battery post. Early vehicles had both positive and negative grounds. USA passenger vehicles evolved, standardizing on "12 volt" negative ground systems. The resting voltage was around 12.6 volts, with ideal running voltage in the low 14 volt range. Many large commercial vehicles, however, retained positive grounds. Non-standardization of systems meant two-way radios and other add on equipment was generally designed to operate with either negative or positive grounds. This was accomplished by floating the internal negative supply buss, while grounding all normally accessible external user ports to the case or cabinet. These early systems started the trend of negative fuses, with both power leads directly attached to the battery. This was not harmful, because the equipment had a completely isolated internal "ground " that was electrically isolated from all other leads leaving the device. Once any other lead common with the negative bus leaves the case, it is no longer safe to conned the negative to the battery post. It is also not safe to fuse the negative lead. In most early CB and commercial two-way radios, the negative buss inside the unit fully floated from the cabinet and any external ports. This included commercial two-way radios like the Motorola Motrac, Micor, and other expensive, high-quality, radios. The floating negative was universal across brands including, but not limited to, GE and RCA land mobile equipment. The floating negative allowed use of radios in either negative or positive ground vehicles. It also solved ground loop issues, allowing direct connection to battery posts without fire or equipment damage hazards. Equipment manufacturers had no way of knowing if the final installation would be in a negative ground vehicle or a positive ground vehicle. As a result, systems with a floating negative buss were shipped with both negative and positive power line fuses. The floating negative buss system inside the radio allowed safe direct connection to the battery posts, and safe shutdown if either the positive or negative fuse opened. The floating negative power buss made it impossible for starter or charging currents to flow through antenna cables, microphone, or speaker leads. All exiting connections, as well as the case, were electrically isolated from the negative lead. The only battery post negative connection should be to or from another battery negative, the vehicle chassis, and/or the engine block. There should never be a direct negative post path to accessory equipment. Normal vehicle wiring is shown and discussed in detail on this page link. 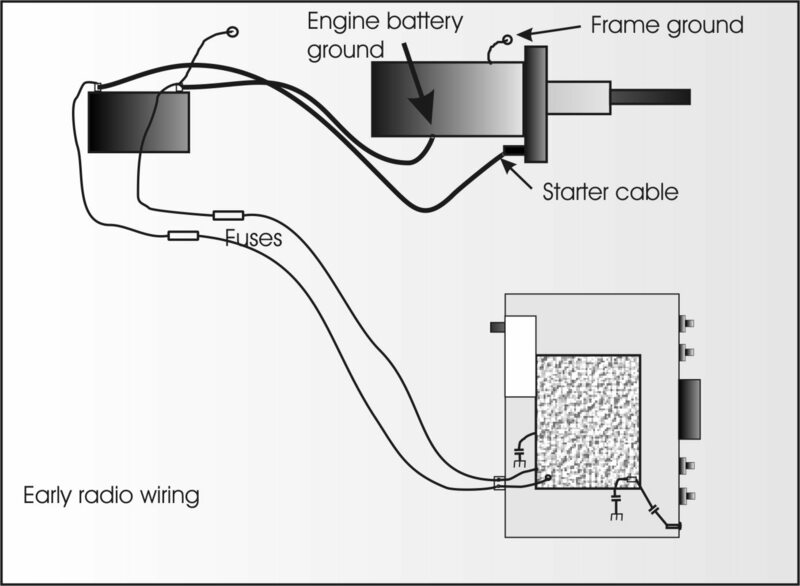 If the ground or negative wire from the radio to the battery opens, radio current would flow from the radio out through the antenna cable, the speaker jack, the key jack, or any other jack or connector that connects to the radio circuit board grounds to the vehicle chassis. 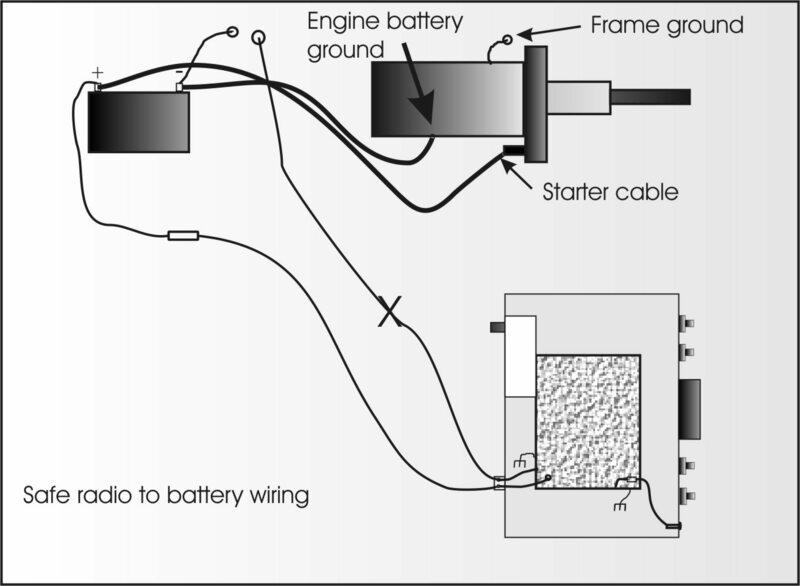 If the battery to engine block ground opens, or the engine block and battery to chassis grounds open, the battery will ground back through the negative radio connection to the radio, through circuit boards or other connections, and to the vehicle chassis. While a radio negative lead fuse will protect higher current circuits, it will not protect small traces or components like those connected to insulated jacks or connectors. For example, when my radio system lost a negative fuse connection, foil traces for the keyer paddle grounds inside my ICOM 751A burned open. I could no longer send CW. This also sets the radio up for increased alternator whine, since load currents can superimpose themselves on traces and connections inside the radio. Connecting the radio or accessory equipment's grounded negative supply does nothing good. Grounding to the battery negative post generally increases alternator whine. It also places the vehicle's computer and electrical system at higher risk, is unsafe for the radio or accessory, and is unsafe for things connected to the radio. I've had vehicles with higher power radios that have opened a negative fuse, and then melted the coaxial cable shield on RG58/U cables. This is because, once the fuse connection was lost, the equipment grounded itself to the vehicle chassis through the grounded antenna cables. It is pretty simple to improve the grounding system. If we ground the radio negative lead to a separate but good chassis ground near the battery ground, ground loops through the vehicle's computer system, through the radio, and through anything connected to the radio or accessory, are completely avoided. Ideally, this ground should not share the bolt that grounds the battery to chassis ground cable. The negative power ground should be on its own bolt. The fasteners should be good hardware, with proper star washers. The ground must provide solid, reliable, mechanical and electrical connections. If the radio or accessory device's chassis power ground lead opens, only radio or accessory current will flow through the radio circuit boards. While this may still open a trace, it is much less likely to happen because we have eliminated a needless weak point, the negative fuse, and we have eliminated the direct connection to the battery where battery acid slowly eats away at connections. A vehicle chassis power ground completely eliminates the current path through the radio or accessory if the engine block ground battery lead opens, and alternator AC ripple no longer can drive the negative lead to the radio. Any connection can fail, and in the very worse case possible we have only radio operating current. In most cases, we will not even have that. It also helps to have multiple ground points as additional insurance against the negative power lead accidentally floating. Published standards specifically tell us to not ground to the battery post, and not to fuse the negative lead! made. Do not connect the negative power line directly to the battery. fuse box. It is recommended that this point be used for installations in this instance. this case an existing vehicle earth point must be used. 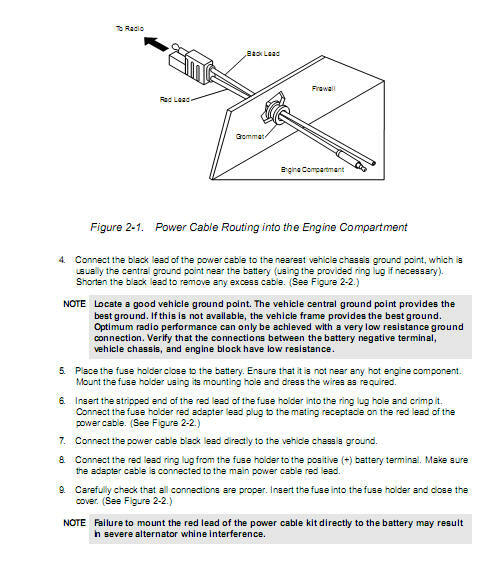 Motorola warns to not use a negative fuse or battery negative post connection, but rather directly connect the negative lead to the vehicle chassis. Only the positive lead is fused. Only the positive lead goes to the battery post.